Chairman Jean-Paul Luksic said that it was a pleasure to be here in London with their shareholders. I can’t say I felt the same. The company continued its tradition of not giving straight answers to our questions – and compared to the other major mining company AGMs which we attend, there were very few questions. The Chairman began by saying that the safety of the company’s employees and the communities in which the company works is the company’s highest priority. There had been no fatalities last year and no serious incidents for two years. That is obviously and indisputably good. He said that the company’s strategy was: safety first; sustainable cost improvements; introduction of a new operating model; creation of further value by developing existing operations; looking beyond core business for other opportunities. He said that there were many issues which the company addresses and mitigates – environmental, social, operational, financial and technological. With the right people the company remains on plan and on budget and had produced over 700,000 tonnes of copper from its four projects. Revenue rose 37% because of an increase in the copper price and higher sales volume. The company was working towards expansion of operations at Los Pelambres and Centinela. At Los Pelambres it planned to expand production by 55,000 tonnes per year by investing in new equipment. The environmental plan had been approved in February. New production should begin in 2021. At Centinela, there were two alternatives for expansion – one is to build a second concentrator and the second is to expand the existing plant. This decision is expected by the end of this year. He said that there had been a lot of news in recent months about actions taken around the world to the detriment of mining companies. Antofagasta has the advantage of operating in Chile, a mining country and an OECD country. Chile, he said, has a well functioning democracy with robust institutions and an independent judiciary, low inflation and low national debt. It has trade agreements with over sixty countries. The key challenge is increasing productivity, for which the transition to a digital economy is an important step. It is important to improve access to, and the quality of, education. He said that Antofagasta is fully compliant with the UK corporate governance code. Beyond code compliance, he said, the company concentrates on stakeholder engagement and the representation of stakeholder views in the board room. It is very sensitive to the views and interests of its stakeholders The board believes that the company’s current governance structure takes these into account but will continue to improve as regulations and society evolve. There is increasing interest now in new technologies that have significantly more copper than established technology, especially clean energy and electric vehicles. Copper plays a central role in a modern, low carbon world. Traditonal markets in China and other emerging markets will remain the most important drivers for copper in the shorter term. China has favourable demographics, including urbanisation. The source of increasing copper supplies to satisfy this demand is less clear. There is only one greenfield copper mine under construction in the world. A shortfall of copper can therefore be expected. Chief Executive Officer (CEO) Ivan Arriagada said that the company had formalised its sustainability policy last year. It promotes reporting in all areas. The company has made progress. He wanted to report on five areas: people, social development, environment, corporate governance and transparency, and financial performance. People: there were no fatalities in 2017. There had been no serious accident for over two years. The Lost Time Injury Frequency Rate is down. Labour negotiations were completed in 2017 at Centinela and Zalidivar and negotiations at Los Pelambres were completed in March 2018. The Diversity and Inclusion Strategy had been approved by the board last year and the company is working to improve women’s participation at all levels including the board. Social development: the company had consolidated changes made to its social engagement model. There had been no incidents with any of the communities around its operations. It was improving interaction with communities. It may not always agree with communities, he said, but constructive conversation can help overcome disagreements. At Los Pelambres the company worked with the local community and a university on setting up a technical university to develop the skills of local young people. There were currently 300 students there, and the company contributes to the education of children near Los Pelambres. Environment: in February this year Antofagasta received approval for the expansion of Los Pelambres. It was expected that the project would be taken to the board for approval by the end of this year. It should increase production by 55,000 tonnes per year, compensating for lower grades and harder ore. A desalination plant would be constructed to supply this expansion and as backup to existing operations. Antofagasta has for a long time been sourcing water from the sea. The percentage will rise from 45 % once the plant built. At Centinela, 88% of water use is sea water and at Zaldivar 100%. Antofagasta is building solar plants and entering agreements with renewable energy suppliers. 54% of the energy used at Los Pelambres is renewable. It is improving environmental reporting. Its commitments govern its operations. They are fully integrated into the management of its day to day operations. The company is committing to a 3% decrease in greenhouse gas emissions over the next five years. Corporate governance and transparency: risk management is aligned with UK and Chilean best practice standards. There is a whistle-blower hotline for violations of policy. Financial performance: there had been solid progress and improved efficiency. He said that the company’s priorities for 2018 are: zero fatalities, cost savings, improved copper grade, and a commitment to the expansion of Los Pelambres. The formal business of the AGM was introduced by Company Secretary Julian Anderson, and the Chairman called for questions. It was lucky we were there, otherwise there would not have been any. There is a Government Accountability Office ruling that says it is illegal for companies that are evaluated and supervised by Municipalities to transfer financial resources to these local government entities. There is a conflict of interest. The Municipality of Salamanca participates in the environmental evaluation of the Minera Los Pelambres projects, therefore the company must not deliver resources and the Municipality should not accept them. Continuously, throughout its existence, Minera Los Pelambres has had extensions or modifications of its project under environmental evaluation. But in addition to handing money over to the Municipality, the company has never, to prevent corruption, asked for an account of how those resources were being used. The company initially was only going to remove the tyres, but social pressure in Argentina forced it to annul the initial agreement with the government of San Juan, and they had to commit to a new agreement to remove everything. The process of removing the waste is still going on. Influence was brought to bear to ensure that the Chilean government would defend the company before the Argentine government, and the use of falsified and false documents, which led to the dismissal of the chief of staff of the mining minister in Chile. The company paid for Insunza’s advice between 2007 and October 2014. During March and October 2014 Insunza was President of the parliamentary Mining Commission, a period in which he voted against a project that would have terminated the so-called ‘Waters of the Miner’, thus helping mining companies. This is related to the ownership of the waters that emerge within a mining site: by the sole act of the law they become the property of the company. We understand that the prosecution is still investigating, and other accusations that also involve state mining company Codelco have been added. Sam Hayward, of ShareAction, said: “Last year we asked you to commit to setting clear emissions reductions targets, so I’d like to start by congratulating you on setting such a target in 2017. This is good progress. “One of the ways that you claim you want to hit this target is by sourcing energy from renewable sources. In your 2016 Sustainability report, you committed to sourcing 80% of total energy for your mine at Los Pelambres from renewables by 2019 – though I understand that a lot of this energy is planned to come from the Alto Maipo hydroelectric project, which has a sour history. “However, you still lack renewables targets for mines located in the Antofagasta region of Chile. As you may know, this region sits on the equator and enjoys the highest solar incidence of anywhere else in the world. There is a huge opportunity here for your group to invest in solar projects in this region. This will go a long way to meeting your climate commitments. If Antofagasta are serious about attempting to decouple growth from emissions, they will need to massively increase the amount of energy they source from renewables. Sam asked, “Do you foresee setting renewables targets for your other operations in Chile? Minera los Pelambres has a contract with Aes Gener to provide energy from its Alto Maipo project. Although the Luksic group no longer part-owns the project, they maintain the supply contract with Alto Maipo for future expansion. The Alto Maipo project has been in conflict with the community since 2008, especially since construction began in 2012. The project is partially stopped halfway through. It is a high impact project, it affects the waters for Santiago, it diverts the waters of three rivers along approximately 100 kilometres. There are water tunnels 70 kilometres long. They pass below El Morado Natural Monument where there are glaciers, threatening their destruction. Clearly this is not renewable energy. Ali Sargent said, “My question concerns the Complementary works project at the Pelambres mine, particularly about water. “In February of this year, the Environmental Evaluation Commission of Coquimbo approved the Complementary Works Plan for Los Pelambres, which is projected to cost one thousand one hundred million US dollars. This is a project which would allow Los Pelambres to maintain the current level of recovery of copper despite a lowering of the quality of the ore – in other words, more rock will be dug up to get the same quantity of copper. “One of the principal elements of the complementary works is the desalination plant, presumably because local sources of water in the Choapa Valley have been exhausted or are in danger of exhaustion. As I understand it, the complementary works project seeks provide desalinated water for both mining and human consumption. There are grave concerns over the suitability of desalinated water for human consumption, and there was controversy on this precise matter in the city of Antofagasta a few years ago, where the company Aguas Antofagasta was involved in provision of desalinated water. It would be good to know the nature of the relationship between Aguas Antofagasta and Antofagasta Minerals. How will Antofagasta plc ensure that any water made available by desalination for human consumption around the Pelambres mine is actually fit for that purpose? Will the company also ensure that water of adequate quality is available for agricultural purposes? The construction of the desalination plant is a recognition of the profound water crisis in the valley. During the recent years of drought, people lost crops and there were difficulties of water supply for human consumption. But the mining company never halted its operations so that good quality fresh water would be more readily available, thus compensating the local community while it experienced the shortage. Modifying the project to maintain ore extraction levels requires processing more rock and using more inputs, including a fundamental one, water. During the years of drought the mining company never showed sensitivity for the community: the company has high quality fresh water available free on its private property, therefore the company will continue using this water that allows it to keep its costs low. The rest is propaganda. It allows the company to fill its sustainability reports, but it is not reality. The company monitors itself. It pays for the water tests. They are not reliable. When people have protested because of the water quality, the company silences the protests with money and economic compensation. This is what happens in Caimanes and other places in Salamanca. The controversies have not been resolved, they have been silenced with an aggressive strategy of co-optation of the community, of diverting attention with the financing of projects where people obtain some material benefit. Sebastian Ordonez, of War on Want, asked whether Antofagasta currently released information regarding its supply chain, including where the copper goes once it is extracted, and if not, would the company be willing to produce such information, in the spirit of transparency, to guarantee the protection of human rights? Jean-Paul Luksic replied that most of Antofagasta’s concentrates today go to Japan. This had been the case for a very long time. He said he was not sure he understood the issue of human rights violations with regard to the sale of concentrates. There is no information on the chain of production and supplies in the extraction and sale of copper from Minera Los Pelambres. 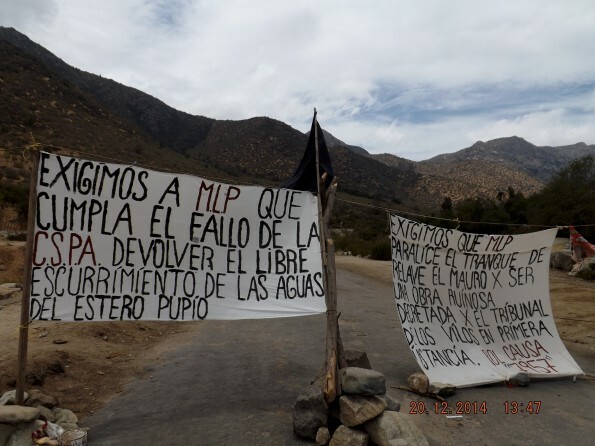 The water and pollution problems in the Choapa valley are a violation of human rights. Minera Los Pelambres installed a ballast deposit on a glacier, among other actions. Sebastian explained he meant the way copper was used to produce electronics equipment in, for instance, China, where human rights violations may occur. Jean-Paul Luksic replied that Antofagasta had a very long-standing relationship with the purchasers of its concentrates and cathodes and had no doubts about their behaviour. Ivan Arriagada replied, “We work to ensure that the copper we produce is done according to standards we are committed to.” Internal controls meant that the company could trace the compliance of suppliers including their hiring practices and union rights. All of this, he said, is disclosed in the company’s reports. Clients are essentially Japanese companies which are well known, and that is disclosed in the marketing section of the report to the extent that it is relevant. “Traceability and supply chain responsibility is important to us and we make sure we buy from suppliers in accordance with the values that we hold, including human rights,” he said. The issue is not only the supply chain: we must also see the precariousness of employment. Los Pelambres works with 70% outsourced work, precarious work, low quality. They cannot talk about high standards with this proportion of outsourced work.